Complete program that will help you organize your bank accounts and investment information, personal web accounts, money related web resources. Intuitive interface and ready-to-use templates make it easy to set up and use. Complet program that will help you organize all your finance information. Contains 4 ready to use organizers (data templates): ACCOUNT: organize account transactions. PORTFOLIO: organize and track investments. MYWEB: organize your private web accounts. ALLWEB: lists top online finance and investment resources. DESIGNER DELUXE (included) allows you to easily create your customized money organizers. JW CLM Scheduler is a JW theocratic software app to help elders schedule the Our Christian Life and Ministry Meeting CLM. It's simple to use, time-saving and secure. It produces attractive&appealing schedules that can be given to elders&students. Balance all your checking and savings accounts on your PC. Enter transactions and the actual balance is automatically calculated. Set a "Cleared" date and the bank balance is automatically calculated. Print and design your own checks. 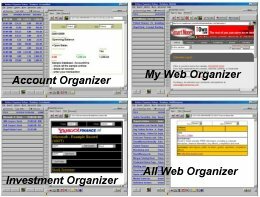 Complete program that will help HOME PC users organize and manage contacts, inventories, improvements and projects, journals, digital images, important lists, web resources, and more. More than 50 ready-to-use templates. flin4pay is a control payments software to optimize family expenses planning and personal accounting. All you have to do is just enter your daily payments and date along with a short description and the software will keep track of your finances!